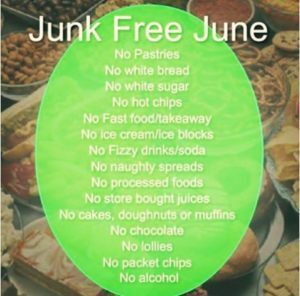 The nurses and I here at Village Health have decided to challenge ourselves this June, by partaking in the Cancer Societies’ fundraising initiative ‘Junk Free June’. Each of us have discussed what we think would be the hardest ‘junk’ to give up. For some, fizzy drinks, and for others, chocolate and alcohol. Personally, I could go without fizzy drink without feeling at all deprived, but tell me I can’t have my wine after work? Hmmm. Now I’m wondering if this was such a good idea. Too late, we’re doing it. The whole point of Junk Free June is to do your body a world lot of good, while challenging old habits (and of course supporting a good cause). These days we are spoilt for choice when it comes to convenience foods and cheap, nutrient poor rubbish. As a consequence our health ultimately suffers because of poor diet, whether due to lack of activity to ‘work off’ our indulgences, or simply because the nutrient poor foods do not fuel our body with the things it needs. Our immune systems begin to weaken, we feel tired, grumpy and down in the dumps. So, if you want to jump on board and deprive yourselves with us this June, here’s a few ideas to help you get started. Have a think about how much ‘junk’ you could remove from your eating regimen. You might even like to make a list. Now consider the likelihood that you will be able to refrain from consuming said things for a whole MONTH. It might be a good idea to pick out a few ‘junky’ culprits and work on those rather than setting a task so big, you don’t even try. Swaps for sweets… How to satisfy that post-meal sweet craving? Be prepared for this one! In my experience, this can be quite the craving! Have some fresh fruit handy. If you’re like me, you like the fruit chopped into pieces so you can eat it with a fork and savour the juicy goodness. Make yourself a hot drink at the same time to help fill the gap even more. Other ideas: mix 2 teaspoons of milo in a cup of hot trim milk; enjoy half a cup of natural yoghurt with some chopped fruit; chow down on a handful of dried fruit. Plan your food intake for the next day. Whether this is packing a lunch box; planning where you will buy your ‘junk-free’ lunch; defrosting some meat for tomorrows dinner; throwing a few pieces of fruit into the glovebox; having some boiled eggs in the fridge for when you get home from work and raid the fridge. If this is something you have been planning to do for a while, Junk Free June provides the perfect platform to ‘give it a go’ for a defined time period. Finally, it’s a bit of fun. Well, maybe fun is not quite the right word, and I should point out that total avoidance of ‘junk’ foods, is not usually my philosophy. However, Junk Free June is an opportunity to see how far you can move away from the little luxuries we have become so familiar with in daily life – for one month. If total abstinence is not your thing, perhaps ‘reining it in’ is a better way to approach it. If you decide to go ahead, check out www.nz.junkfreejune.org.nz for fundraising tips and the ‘official’ promotional stuff. 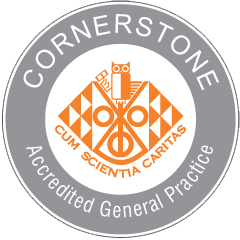 Otherwise, spare a thought for the nurses and myself here at Village Health as we put ourselves to the test for charity.